Student research provides a multifaceted approach to improving retention and graduation rates. Students involved in research will be financially supported through grant funds, mentored by faculty, and trained in discipline-specific techniques. Experiential learning, a preferential learning method for this generation of college students, will be utilized through the research process. Research opportunities will be available at both the basic or applied (molecular or field) level at both institutions to further provide an individualized approach based on student career goals. Students participating in the LEADERS program will be able to apply skills gained through hands-on experiences to their academic knowledge base. 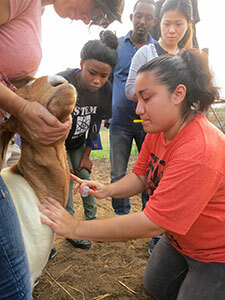 Information from various animal science courses and statistics will be put to use in order to conduct individualized research projects. Faculty mentors will work closely with LEADERS to ensure they receive proper training necessary to complete their projects, analyze the data, and communicate the results. The one-on-one interaction between faculty and students will lead to greater student success due to defined academic goals and awareness of future educational and career opportunities. Information on specific research projects conducted by each student will be added soon!